A trip to Sepilok Orang Utan Sanctuary is compulsory whether you travel to Malaysia for fun, for its great beaches, for its one of a kind spas, for its unique fauna and flora or for its wonderful sightseeing. Orang Utans or “men from the forests” are part of the locals’ life and such a visit will definitely help you understand more the locals and their culture. Furthermore, you will find out interesting things about these cute relatives of the human kind. Sepilok Orang Utan Sanctuary was created in 1964 in the Kabili-Sepilok Forest Reserve. Here, in about 4,300 hectares of virgin forest, the orangutans taken from poachers or households keeping them as pets are treated and re-educated in order to be reintroduced in the wild environment. 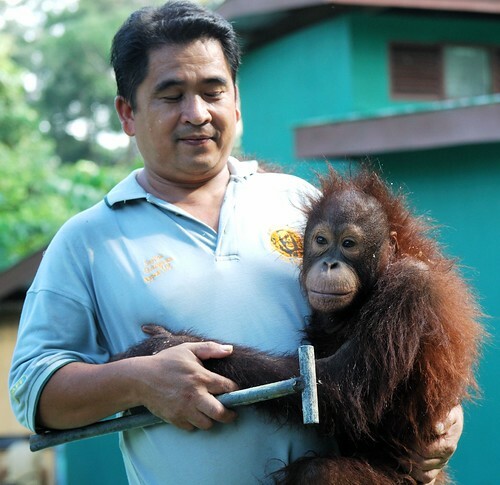 The center’s primary goal is that of teaching orangutans how to survive in the jungle. Yet, sometimes other animals, including Sumatran Rhinos, sun bears and gibbons are taken in custody for medical care. Injured elephants may also be seen around from time to time. Long tail and pig tail macaques may also be spotted around as they have found a great source of regular food at the Sanctuary. So, if you had no luck with the orangutans, some other wild animals may cheer you up. Most travel agencies offering Sabah holidays include a tour to Sepilok Sanctuary for a day of admiring the orangutans. 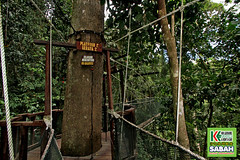 Some also have complimentary activities included, such as jungle trekking and visits to the nearby attractions. If you choose such a package, then all you have to do is admire the palm tree orchards on your way towards the Sepilok orang utan sanctuary and make the most of your visit there. If, on the other hand, you have not enrolled in any of the Borneo orangutan tours from home, you will need to find your own way to this wonderful spot. Located 25 kilometers away from Sandakan, the Orang Utan Sanctuary can be reached by taxi or by bus. Once you have seen the orangutans, you can take the taxi back or retire in one of the neighboring resorts. A stay in the Sepilok resorts will give you the chance to see the orangutans in the following morning and will offer you the possibility give a new turn around to your tour to Sabah Malaysia. People here are warm and friendly and can always guide you, in fluent English, towards the most enchanting places from the area. For a tranquil setting and unique accommodation book one of the chalets from the forest. If you are not into spending the night in Sepilok, you can arrange to travel back with a boat, so that you can make the most of your tour to Sabah Malaysia. More adventurous people will certainly enjoy the Mangrove Forest Trail, a 5 kilometers trail through Sepilok Laut. During the 2 or 3 hours of trekking you can see some very interesting water holes, transitional forests, wildlife tracks and pristine lowland rain forest. Also, if you want to experience more Borneo orangutan tours in one can choose to spend half day at the Sepilok Sanctuary and the other half to dedicate it to the Labuk Bay Sanctuary for a quick glimpse into the Proboscis monkeys’ life. Sabah holidays offer something for everyone, regardless of age or personal preference. Nature is something we all should love and cherish and this is only one lesson that we can learn from the people working at A trip to Sepilok Orang Utan Sanctuary.